You found the perfect diamond yet there is still one thing that you need to analyze, the price. The price is the trickiest part when deciding whether you want to buy a diamond or not. Many individuals are stumped with determining the value of a diamond. No one said it was an easy thing to do! While many people are overpaying for their diamonds at jewelry stores, it is because they haven’t been properly informed on what makes a diamond valuable. Once you understand a diamonds price per carat, and how to determine its worth, you will never spend more for what a diamond is worth. It is very easy to spend way more money then what a piece of jewelry with diamonds is actually worth; it happens every day. Individuals walk into a jewelry shop without having any former knowledge of diamond pricing and how to determine their value. In fact, many people go in just looking for a nice gift and walk out spending thousands of dollars more than they should have. If you want to ensure you aren’t getting ripped off, the only way is to play your retailer. This means you need to understand the diamond price calculator, how it works, and how to determine a diamonds worth by just looking at it. At the end of this article, you will be able to successfully save thousands of dollars on finding the right diamonds. Before we get started and dive into pricing, it’s important to start with knowing what you want and how to ensure you’re getting what you’re paying for. There are three essential rules to follow when you are buying a diamond. Follow these steps carefully and you will find yourself getting a great deal and the diamond of your dreams. The most important step of all is making sure you are buying a diamond with a certificate. Now if you are looking for a diamond under $1,000 it may not even have a certificate, however, anything above $1,000 is imperative it has one! The certificate gives the buyer a piece of mind that they are getting exactly what the retailer claims. The only laboratories certificates can come from are GIA, HRD and IGI! this way you can determine if it’s a fake certification if it’s not either one of these. Unfortunately, many individuals are fooled by retailers who don’t provide certificates, or give certificates from other sources which are not valid, worthless or handwritten. The worse that can happen is that you are given a false diamond! Now you know which certificates to look out for, next you need to understand the qualities listed on the certificate. This will ultimately give you the value of the diamond, and determine if it is matching up with what the retailer is selling you. The quality is determined by the four C’s of diamonds; color, clarity, cut, and carat. Color: Diamonds can come in many colors, which they receive a grade for the amount of color they may contain. From white to yellow, many individuals prefer a diamond with no color which is usually grades H or higher. Clarity: The clarity is what determines the purity. Each diamond is assigned a grade; IF or FL, representing flawless, to I3, describing a diamond with inclusions. Most individuals looking to buy a diamond purchase one with slight inclusions to reduce the price of the purchase. Cut: The cut describes the polish, proportion and the finish of a diamond. These factors are what determine the brilliance of the diamond. Carat: The carat refers to the weight of a diamond. One carat weighs 0.20 grams, and the larger a carat the more expensive the diamond is. Although some of the other “C’s” can influence the price of a diamond. Now that we have determined the basics of what the diamond should include, hopefully, you have a better understanding as to which diamond you are looking for. Next, you need to figure out the price. A jewelry store will often be more expensive then what you see online, however, most shops online sell very very low quality diamonds to be “competitive”. 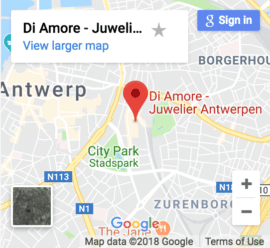 Therefore, the best place to buy diamonds would be in the Trading Street in Antwerp called the World Diamond Bourse of Antwerp – Hoveniersstraat. There only you will find the most reliable jewellers with trusted certificates and correct prices. In the world of diamonds, there are some basic universal rules you need to know. The most important one is to know the price per carat. It is good to keep in mind that diamonds prices per carat rise in heavier weight categories. This means that diamond gets more expensive with weight. So when you are trying out rings or earrings, you can also feel the weight difference between the different carats. Categories are extremely important when choosing a diamond, and we can’t stress that enough! Many individuals start to believe that prices per carat only increase as weight increases. It’s not! You will be shocked to learn that 0.99ct diamond is barely worth any more than a 0.98ct. However, a 1.00ct diamond is worth so much more than a similar 0.99ct diamond! Why? Well, basically because you can now say it is a one-carat diamond. It is that step from not being entirely a full carat to then all of a sudden, the diamond is now a full carat. That is where the pricing comes from. Think about it this way; diamonds run on emotions, and one carat sounds pretty magical than a 0.98ct diamond; hence why retailers price a one-carat diamond about %20 higher than a 0.99ct diamond! What an eye-opener! Do not underestimate the cut. The shape and cut of the diamond have a large impact on price, just the same as any of the other “c’s”. However, the cut can also take effect on the carat, and many retailers still sell a diamond for its original price before they shaped and cut some of it off. Either way, the cut of the diamond is extremely important to understand. You will see a major price difference from a round cut to an Asscher cut. For example, a round 1ct-diamond will start at roughly $5,257, and a princess cut 1ct-diamond starts at $3,944. They are both the same carat, so this proves the cut, in fact, does affect the price. Sometimes a jeweler claims they have a lost certificate for certain Diamonds. Start worrying! This may not be a good sign at all. They might try to sell you a fake diamond or fake certificate which is handwritten. You would want to avoid this shop. A legit professional retailer would always sell a valuable diamond with his certificate which comes with a GIA, HRD or IGI certificate. It is common that diamonds with a low (I1) clarity grade do not come with certificates. Why is that? Because many of these diamonds are not worth a lot, so they don’t necessarily need one. This doesn’t mean the diamond isn’t legitimate, or that they are ripping you off, it just means the diamond is not of high quality and is not worth spending more money on a certificate from an independent institute. Shop around for a shop that works hand in hand with the Bourse of Diamonds like Di Amore. Now you should feel more confident than ever navigating the diamond market. Buy diamonds from Di Amore to receive the absolute best value with live trading prices. Our team of diamond experts will find you your dream diamond.